Of all the courtly arts practiced by King Henry VIII, music was undoubtedly his greatest passion. As well as being a talented harpist and composer, Henry was a great patron of the musical arts in Europe, and his reign heralded a golden age in English choral music. Henry employed 58 full-time court musicians, more than any other monarch before or since, including a chapel choir that was said to be “more divine than human”. Many of today’s great English musical institutions such as the choirs of Christ Church, Oxford and King’s College, Cambridge were founded during his reign. Several manuscripts survive to testify to Henry’s love of music, but the most important is the Royal Choirbook, now British Library Royal MS 11 E XI. This magnificent collection of motets was presented to the 27-year-old Henry and Catherine of Aragon in 1518. It is exceptional for the sheer size and luxury of its production, its exquisite and ingenious heraldic illuminations, and not least, its personal significance to Henry. 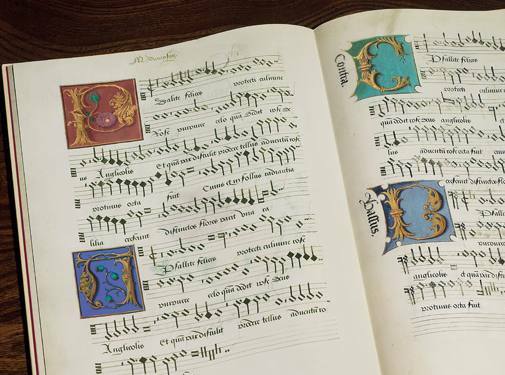 The Royal Choirbook was commissioned and designed by Petrus de Opitiis, an Italian merchant, and his son Benedictus, a talented organist who hoped to gain a position at court. Together they created a magnificent large-format volume of 6 motets. Composed by Benedictus and a musician named Sampson, these motets were written to appeal to the king on the deepest possible level, reflecting both his royal status and his dearest wish: the birth of a male heir. The Choirbook opens with a sumptuous frontispiece, rich in symbolism carefully chosen to celebrate Henry’s lineage. It depicts a rose bush with 3 large blooms. One is the red rose of Lancaster, while the red-and-white rose depicts the union of the houses of York and Lancaster. The crowned rose represents King Henry himself. 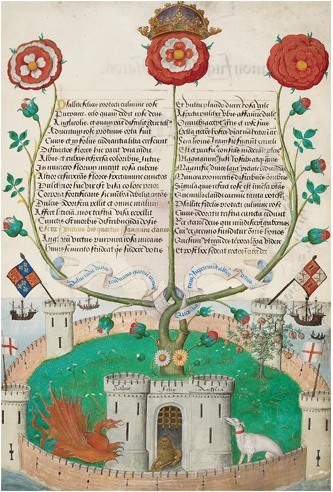 A pomegranate tree, shown blooming in the garden of England, is the symbol of Catherine of Aragon, while a daisy and a marigold represent Henry’s two sisters, Mary and Margaret. As well as being a breathtaking piece of heraldic art, the frontispiece ingeniously incorporates the texts of the first two motets, Salve radix and Psallite felices, with Henry’s name highlighted in gold leaf. 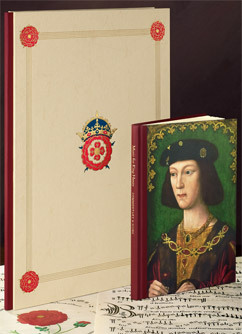 Deluxe facsimile edition limited to 500 copies, in quarter buckram with vegetable parchment boards, with gold and colored foils, edge-gilding and slipcase. With CD recording by the “Alamire Consort” directed by Dr. David Skinner.